How about a nice breakfast of biscuits and gravy? Rich, creamy, thick homemade gravy loaded with country pork sausage, smothered over warm biscuits. Oh yeah! 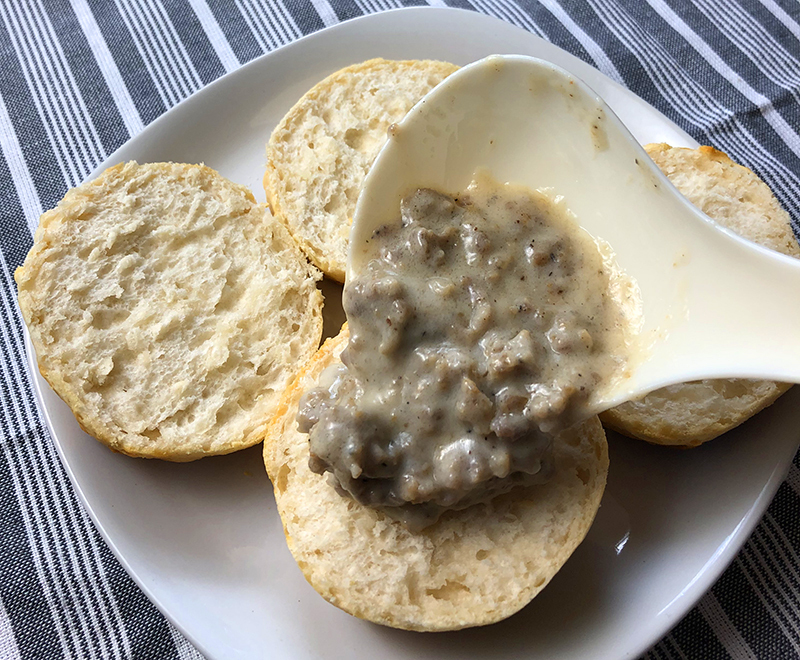 This recipe for Instant Pot sausage gravy will make this breakfast classic one to remember. Breakfast is probably my favorite meal of the day. During the busy work weeks, all too often breakfast winds up being something quick like fruit or cereal or something easy to make that I can take on the run. But, when it’s the weekend or a day when the whole family is home, we love to enjoy a big breakfast. And one of my all time favorite breakfast meals is biscuits and gravy. When we have a chance to go out for breakfast, especially on road trips, we love finding a small diner that specializes in big breakfasts. You know the ones… you can smell the bacon, sausage and breakfast goodness from a mile away! But when we’re not on the road, and want to make a big breakfast at home, our favorite kitchen appliance – the Instant Pot, always seems to come to the rescue. We start with 1lb of pork sausage. You can often find fresh pork sausage in the supermarket meat section, but the kind that comes in a tube is just fine. There’s several brands I love, but even my local store brand pork sausage is delicious. 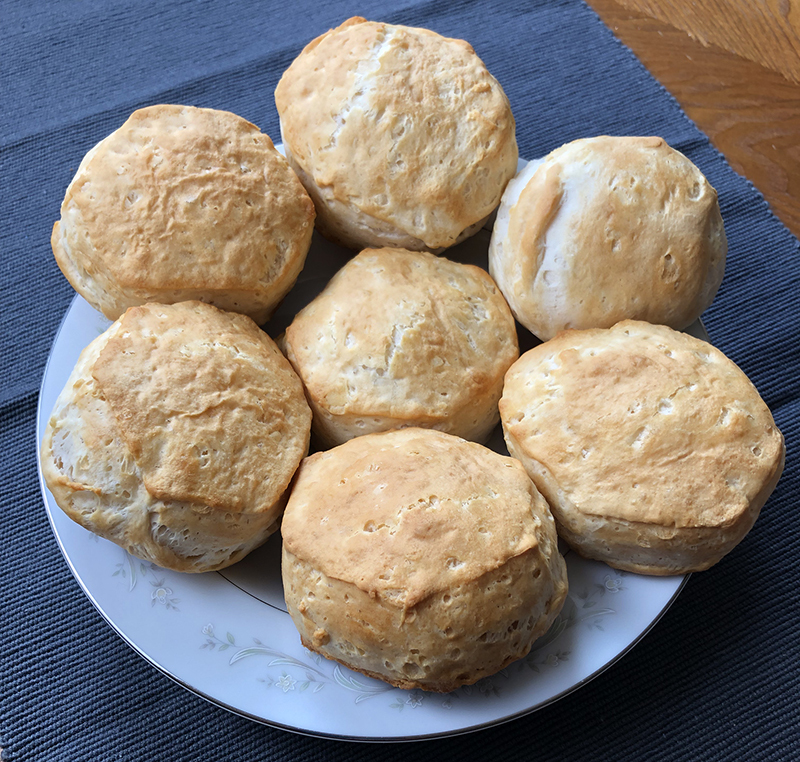 For the biscuits, I just use store bought biscuit mix or the kind that comes in the rolls which you pop open and bake in about 15 minutes. You can really use any kind of biscuit, but I like to find ones that are “homestyle”, as opposed to the flaky layered biscuits. 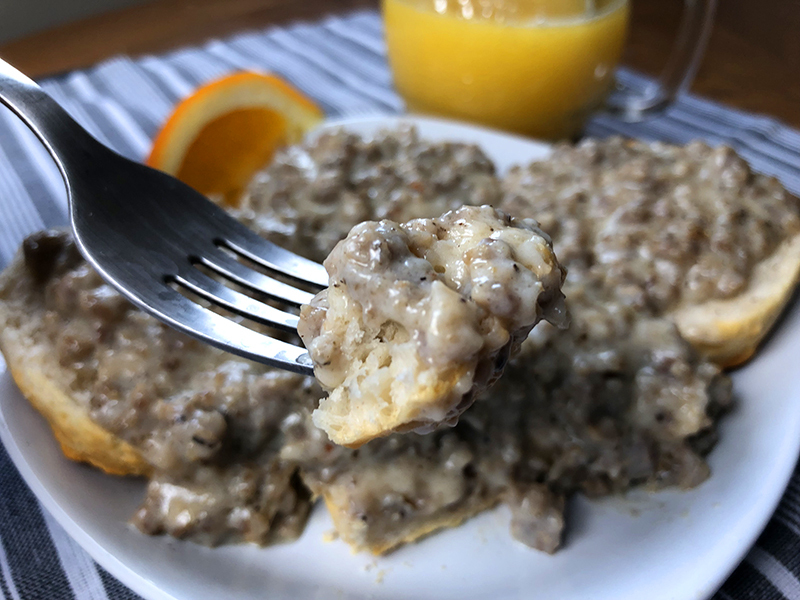 The homestyle ones are the more classic biscuit for biscuits and gravy. 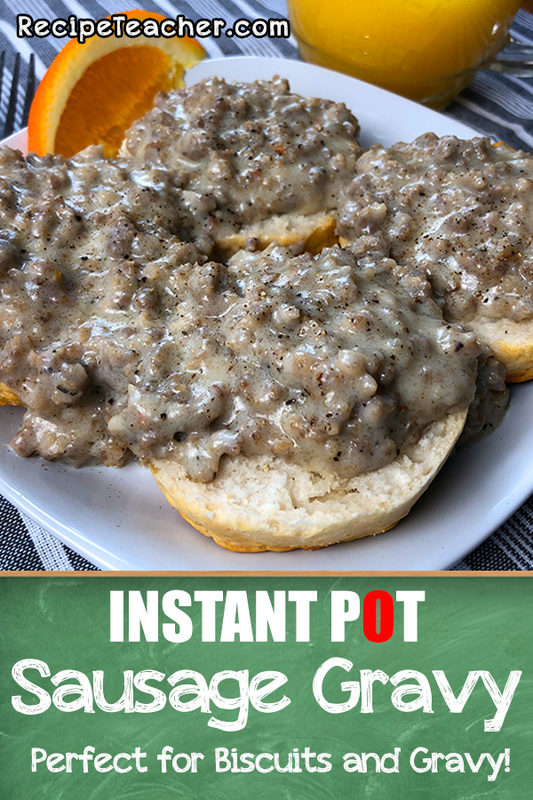 Once we have the biscuits in the oven, you can start the gravy recipe by first spraying a little nonstick cooking spray in the Instant Pot liner. Sausage gravy likes to stick and the spray helps. Saute the sausage until it’s all cooked through, about 5-7 minutes. During this time, keep moving it around with a wooden spoon and scraping any that does stick to he bottom. As the sausage cooks through, the bits that do stick will come up easily. Once it’s cooked through, do not drain. Add the flour and mix it in. Then add the salt, pepper, onion and garlic powder and mix it well. Then add the 1/2 cup of chicken broth and two tablespoons of butter right on top. Pressure cook on high for 2 minutes then do a quick release. Remove the lid and press cancel. Add the milk and press saute and stir for a couple of minutes. The sausage gravy will thicken as it heats and you stir. You’ll only need to do this for a couple of minutes. Press cancel and leave it sit and thicken for a couple more minutes. 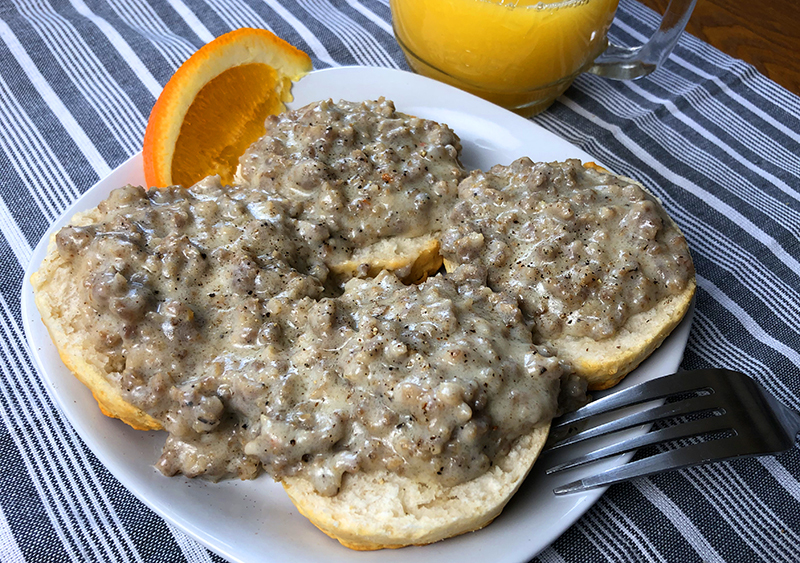 When you biscuits are done in the oven, slice them in half and serve to warm sausage gravy right on top. Spray Instant Pot liner with nonstick cooking spray. Press saute and add pork sausage. Use a wooden spoon to breakup sausage while it browns. Cook sausage through until no longer pink. This should take about 5-7 minutes. When done, press cancel. Add flour, salt, pepper, onion powder and garlic powder and stir well. Pour in chicken broth. Place butter right on top. Secure lid, set vent to sealing position and pressure cook (manual) on high for 2 minutes. When time in complete, do a quick release and press cancel. Remove lid and add milk. Press saute button and stir for a couple of minutes, just until the gravy starts to bubble, then press cancel. Gravy will thicken during this time. 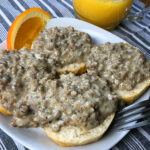 Serve sausage gravy over warm biscuits and enjoy!